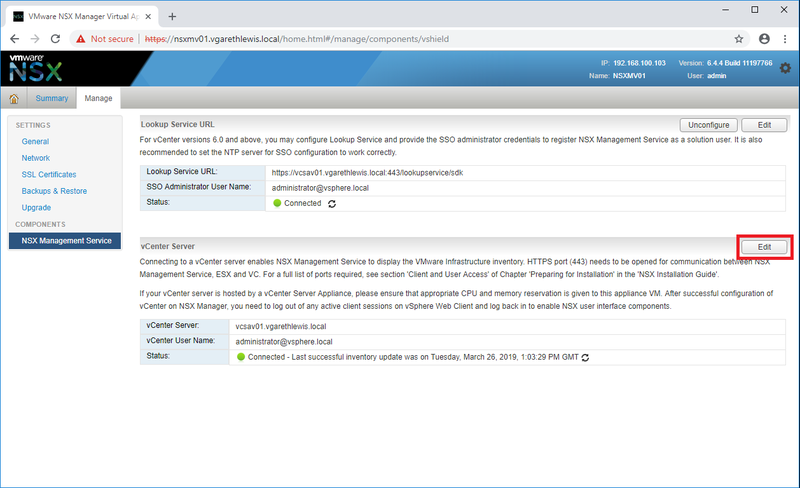 Following a recent upgrade of VMware NSX Data Centre for vSphere from 6.4.1 to 6.4.4, the option to access NSX’s Networking and Security extension from within the vSphere Client (HTML 5) had simply disappeared. This left me scratching my head a little, more so as I’ve completed this upgrade (what seems) a million times. Scenario-wise, I had completed the initial NSX Manager upgrade, but after logging in to the vSphere Client, I noted the Networking and Security extension failed to display. 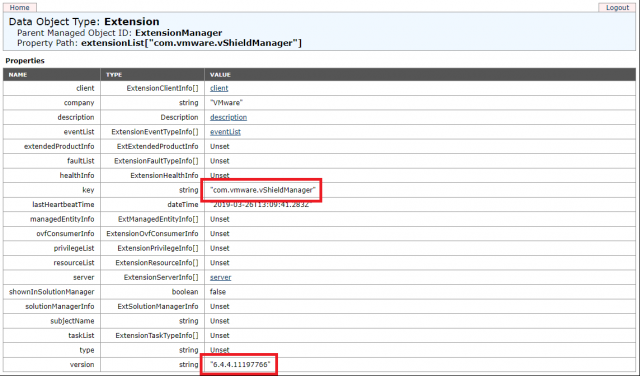 First of all, let’s take a look at the NSX Manager. 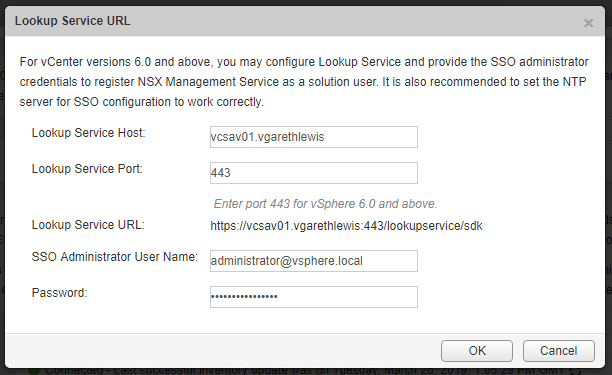 Both the Lookup Service URL and the vCenter Server connections show successfully connected. So, no issue there. Digging a little deeper and browsing to the vSphere Managed Object Browser, I could see the com.vmware.vShieldManager extension is present, however, the com.vmware.nsx.ui.h5 extension is missing. Lastly, let’s check to see what packages are stored in the /etc/vmware/vsphere-client/vc-packages/vsphere-client-serenity/ directory, as I’d like to identify whether any legacy versions of the package are hanging around, potentially causing a conflict or issue post-upgrade. For this, simply SSH to your vCenter Server, enter Shell, change directory, and list the directory contents. From the below screenshot you will note multiple versions of both NSX and vShieldManager packages. This will need a little clean-up. 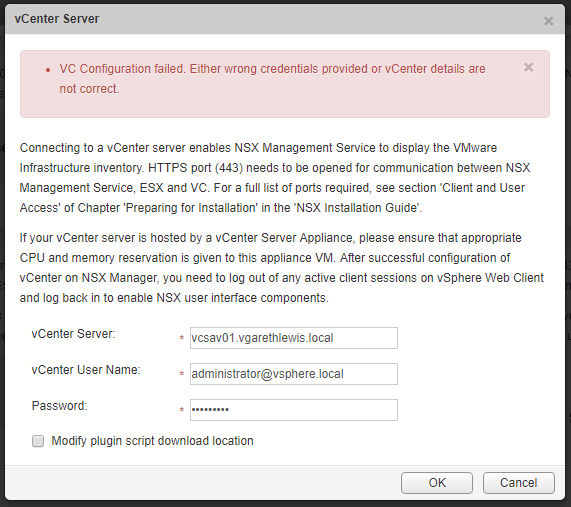 During the upgrade procedure, I can only surmise that the registration of the NSX extension with our vCenter Server failed, potentially due to the multiple legacy packages. For my own sanity, I will clear these before I begin working to re-register the NSX extension with our vCenter Server Appliance. Below, I detail the steps needed to clear these legacy packages and re-register the extension. 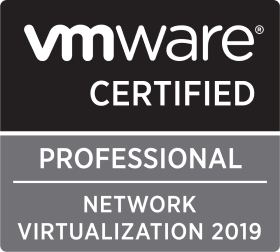 At time of writing, this is not something documented by VMware, so please do NOT consider this procedure as supported by VMware. 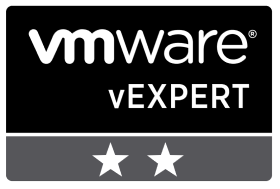 Please contact VMware GSS in the first instance. 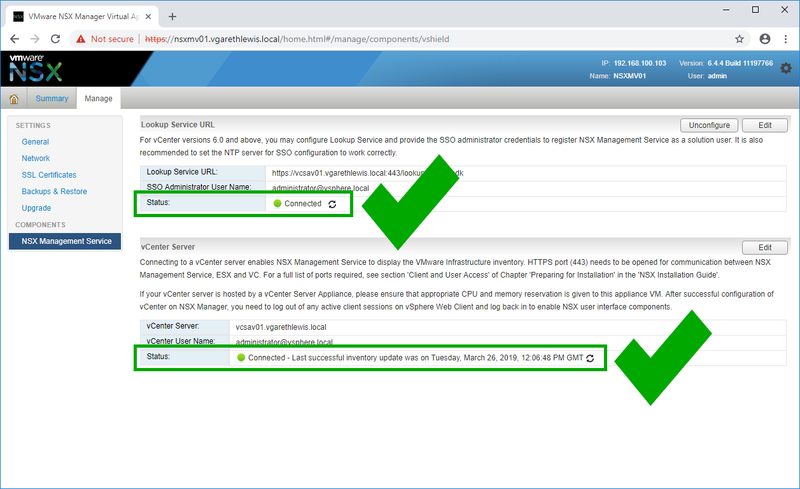 The environment in question is running vCenter Server 6.7 Update 1 (vCenter Server Appliance) and VMware NSX Data Centre for vSphere 6.4.4. 1. SSH to your vCenter Server Appliance, enter Shell, and stop both HTML 5 and Flex clients. 2. 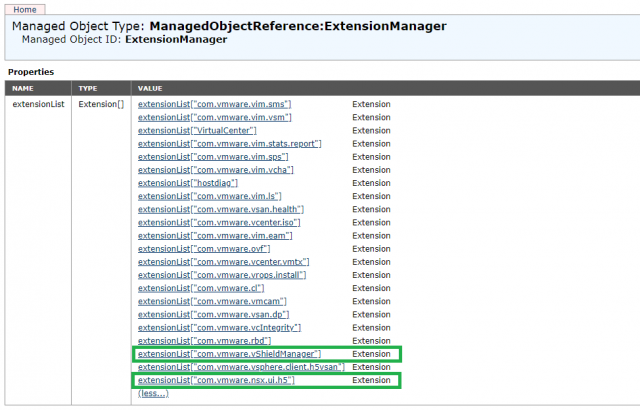 Purge all NSX and vShieldManager extensions from the directories detailed below. This can be done by browsing to each directory (cd), listing the contents (ls) for review, and by removing (rm -r package-name) each package relating to either NSX or vShieldManager. Browse and view contents of the vSphere Web Client (Flex) directory. Browse and view contents of the vSphere UI (HTML 5) directory. 3. Start both HTML 5 and Flex clients. 1. 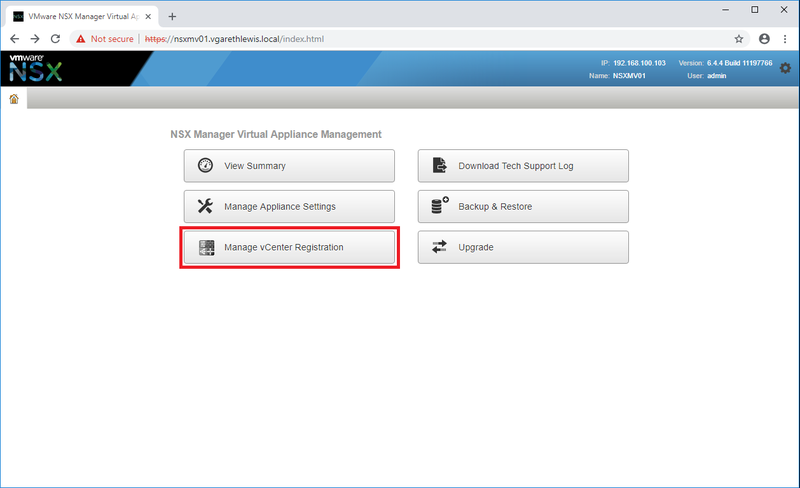 Login to the NSX Manager appliance and click Manage vCenter Registration. 2. Under the vCenter Server section, click Edit. 3. Enter an incorrect password and click OK. This will cause the process to error. 4. This time, enter the correct password and click OK. Once complete, confirm Status is ‘Connected’. 5. Under the Lookup Service URL section, click Unconfigure. 6. Under the Lookup Service URL section, click Edit. 7. Configure the Lookup Service URL and click OK. When prompted, accept the certificate thumbprint. 8. Once complete, confirm Status is ‘Connected’. 9. 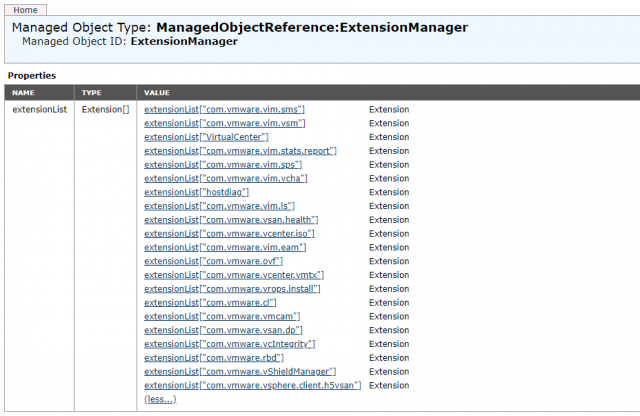 Browse to the Managed Object Explorer once more, refresh the extension list, and confirm both com.vmware.nsx.ui.h5 and com.vmware.vShieldManager extensions are now present. 10. Confirm the version of each extension is correct in relation to your version of VMware NSX Data Centre for vSphere. 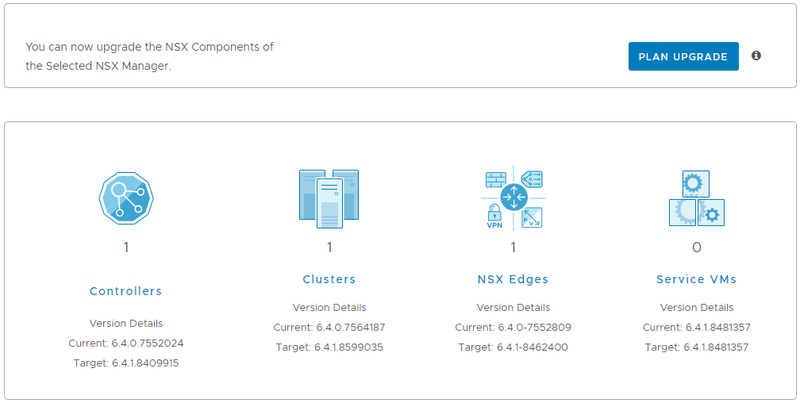 The com.vmware.nsx.ui.h5 extension displaying the correct version. 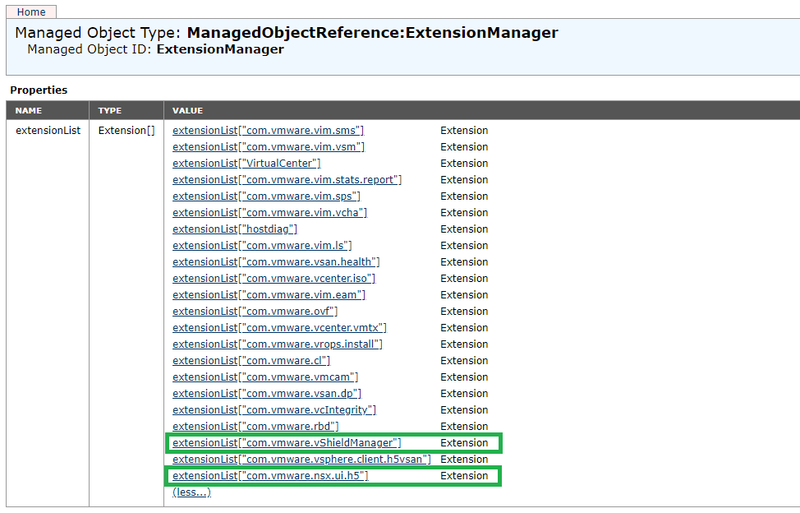 The com.vmware.vShieldManager extension displaying the correct version. 11. Lastly, clear your browser’s cache, login to the vSphere Client, and confirm access to Networking and Security has been restored. Access to Networking and Security restored.